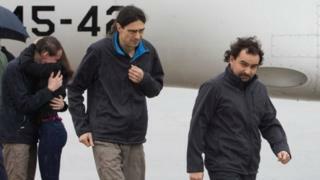 Three Spanish journalists, kidnapped while working in Syria last year, have been released and have arrived in Madrid to a rapturous reception from friends and family. Antonio Pampliega, Jose Manuel Lopez and Angel Sastre disappeared from the northern city of Aleppo 10 months ago. The three were flown on a Spanish defence ministry jet from Turkey. They appear to have been captives of al-Qaeda's Syrian affiliate, the al-Nusra Front. Al-Nusra was in charge of the part of Aleppo from which they were kidnapped nearly a year ago. However the circumstances of their release have not been disclosed. A statement from the prime minister's office said that "allied and friendly" countries had helped to secure the journalists' release, highlighting the role of Turkey and Qatar which had provided assistance "especially in the final phase". PM Mariano Rajoy posted a photograph of them arriving beneath the caption "Welcome!" on his Twitter account. The three men, apparently in good health, smiled and waved as they disembarked from the plane. They were well treated by their captors, the Efe news agency quoted them as saying at the airport. They were welcomed by overjoyed friends and family members and shook hands with Deputy Prime Minister Soraya Saenz de Santamaria at Torrejon de Ardoz air force base on the outskirts of Madrid. Mr Pampliega hugged and kissed his sister Alejandra when she ran to welcome him. "Crying from joy falls short," she said on Twitter on Saturday when it emerged that the trio - all experienced war reporters - had been released and were in good health. Mr Pampliega's mother was equally happy: "He repeatedly asked me to forgive him for what he made me go through." Parts of Aleppo are controlled by rebel groups including so-called Islamic State (IS), who have kidnapped and killed journalists in the past. In 2014, two Spanish journalists were freed after being held for six months by IS. The media rights group Reporters Without Borders ranks Syria as the most dangerous country in the world for journalists.